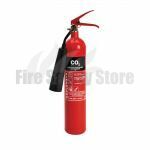 Here at Fire Safety Store, we are delighted to be able to offer you some of the best carbon dioxide, or CO2 fire extinguishers on the market today. Carbon dioxide extinguishers emit gas which replaces oxygen in blazes and takes away the air that forms part of the fire triangle, leaving a blaze unable to keep burning. They are suitable for use in small offices and business premises, shops and warehouses as well as around the home. 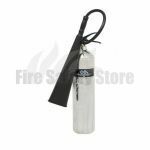 We recommend you team CO2 canisters with a water or foam extinguisher so you are prepared for all fire situations. This is an exceptional product and highly popular due to its reliability and ease of use. As there is nothing inside the canister other than pressurised carbon dioxide, when these pieces of firefighting equipment are called into action, they leave no mess or residue. 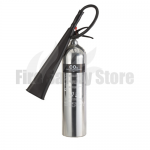 CO2 extinguishers are known the world over for their ability to effectively combat blazes involving electrical items. They cause no damage to electrical items such as computers, photocopiers and printers meaning that an electrical system doesn’t short circuit and no further overheating or explosions which may result in intensifying a fire can occur. As CO2 is a gas however, in time it will likely float up and away from the source of fire leaving the possibility of reignition. With that being said, it is vitally important that all power sources are switched off and electrical equipment is not very hot. 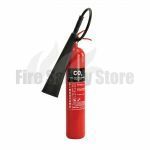 CO2 extinguishers are also adept at tackling Class B fires – blazes involving flammable liquids such as petrol, spirits and diesel. They work in much the same way with Class B fires in the sense that the gas displaces the oxygen and not allowing for combustion. 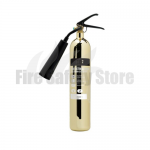 By law, all carbon dioxide fire extinguishers must have a black colour coded label denoting the extinguisher type and contents and be complete with the traditional red body. This helps quick identification in the event of a fire outbreak. CO2 is perhaps the most direct replacement for halon extinguishers. They worked in the same way as carbon dioxide but as the name suggests, deposited halon gas onto a fire. Halon canisters were discontinued in 1994 as they contained chlorofluorocarbon (CFC) which can be potentially harmful to individuals as well as the environment. Of course, carbon dioxide isn’t too kind to human breathing systems and should be used with due care and attention. They replace oxygen and use in small rooms may result in difficulty with breathing. CO2 canisters can become very cold and present a danger of frostbite should the operator touch the horn directly either without thinking or accidentally. 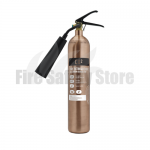 All carbon dioxide fire extinguishers supplied by Fire Safety Store come with a frost free horn as standard, taking away the chances of unwanted injury.? 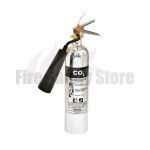 We supply CO2 extinguishers in two sizes – 2kg and 5kg to make your purchase easier. We also have a polished carbon dioxide 2kg solution for places where style in paramount. If you require any assistance feel free to get in touch with our team today on 0800 3160890 who will be happy to talk you through any queries you have and arrange next day delivery on all orders placed before 2pm.